Students are welcome to go and talk to their career counsellor with any problems they might be experiencing with their studies. Angkeriya Oeurn was having trouble with mathematics. Career guidance provided him with new strategies for his studies. Nearly two thirds of the Cambodian population are under 30 years old. Young people have tremendous potential for developing the country both economically and socially – but they need information about education and career opportunities. ”Career guidance has helped me a lot with my studies,” says Angkeriya Oeurn, 15, a high school freshman. ”Before career guidance, I didn’t know where I was, where I should be heading, or how to get there,” he describes. Anlongvil Secondary School in the city of Battambang has had two career counsellors for over three years now. 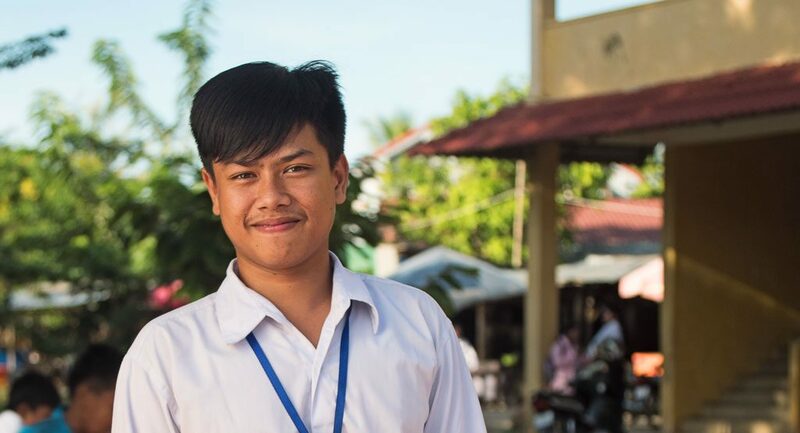 In 2015, it was one of the first schools in Cambodia to start offering career guidance, with support from Finn Church Aid. “Other teachers teach their subject, but the career counsellor teaches how to set goals, spend time wisely, and choose subjects suitable for you. The career counsellor also makes us think about what we want to do in the future,” says Angkeriya. Angkeriya dreams of becoming an engineer. He knows that in order to be admitted as a student, he must focus on mathematics, geometry, chemistry, and physics. ”Career guidance has taught me not only to work for my goals, but also to make decisions. Others won’t make decisions for me,” he says. There is a happy bustle at the schoolyard. The children and young people are chatting, kicking a football, and throwing a basketball into plastic laundry baskets on top of poles held in place by one student at a time. The school is big, with 1,800 students and a hundred teachers. Many have a commute of several kilometres. There is no public transportation. The schoolyard has a guarded parking area for bicycles and motorbikes. Finn Church Aid started developing career counselling in Cambodia in order to narrow the gap between the education offered by schools and the know-how required in professional life. The gap is widened by the number of school drop-outs. FCA trained the first-ever career counsellors in the country making use of the expertise of the volunteers in the Teachers Without Borders network. The results have been good. Schools offering career guidance have seen the numbers of school drop-outs decrease and learning outcomes improve. ”Even if a student ends up dropping out of school, I won’t leave them with nothing; we try to find them a place. Part of my job is keeping in touch with vocational schools and employers,” explains career counsellor Buntith Mak. Career guidance is included in the national curriculum, and more counsellors are continuously being trained in cooperation with the Cambodian Ministry of Education.